FILE - A Massive Ordnance Air Blast (MOAB) weapon is prepared for testing at the Eglin Air Force Armament Center on March 11, 2003. The U.S. Defense Department says its military plane dropped the largest non-nuclear bomb ever used in combat, a 10,000-kilogram bomb, on an Islamic State target in Afghanistan. The bomb is called the Massive Ordnance Air Blast (MOAB). Based on its acronym, the U.S. Air Force has nicknamed it the "Mother of All Bombs." Defense Department spokesman Adam Stump said it was the first-ever combat use of the bomb. Also known as the GBU-43, the bomb was developed more than ten years ago. The bomb was dropped in response to IS' increasing use of bunkers and underground passages to "thicken their defense," General John Nicholson, commander of U.S. forces in Afghanistan said. The Pentagon did not indicate how much damage was done to the IS stronghold or whether there were any injuries. 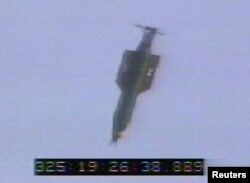 Besides the MOAB, the U.S. Air Force has an even larger bomb known as the Massive Ordnance Penetrator, or MOP. Despite its size, the MOP carries less explosive than the MOAB. It is designed to take out deeply buried targets like reinforced bunkers. The MOP has never been used in combat. The GBU-43/B, also known as the Massive Ordnance Air Blast, is launched successfully from a MC-130E Combat Talon I aircraft during a test at Eglain Air Force Base, Florida, Nov. 21, 2003, in this handout photo provided April 13, 2017. Dorothy Gundy adapted this story for Learning English based on VOA and AP news reports. Hai Do was the editor.